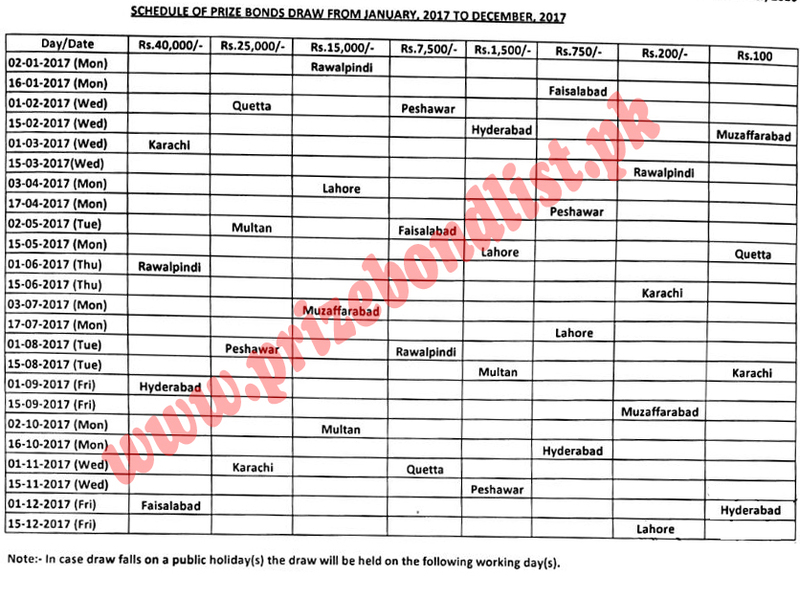 Download Prize Bond Schedule 2019 by National savings of Pakistan. Upcoming Prize Bond lucky draw schedule of all denomination with Draw, Date, Day and city where that is organizing. This timetable is updated each year with dates and city where the draw will be organized by National Savings Organization. The all prize bond denomination comes 4 times in a year and after each 3 month's the specific denomination value prize bond turn held. This current year Prize Bond Draw Schedule List having all Prize bond like Rs. 100, 200, 750, 1500, 7500, 15000, 25000 and 40000 Premiums Prize bond draw schemes will assist you in finding your upcoming money management for buying these bonds. This Schedule National Savings Complete Draw List is provided by www.savings.gov.pk online before the year starts. This chart will inform about next draw dates, cities and about any change in the roster if the Public Holiday has come between the draw dates. No draw is held on Saturday and Sunday because Federal Govt have Public Holiday and hence you must know that these dates will be considered empty in Prize bond draw schedule 2019. The formula maker gives value to the city and date for the selection of prize bond and taking consideration toward playing money games. Pakistan Savings Certificates Prize Bond Denominations have different values and thus bought by the different peoples having the power to buy. 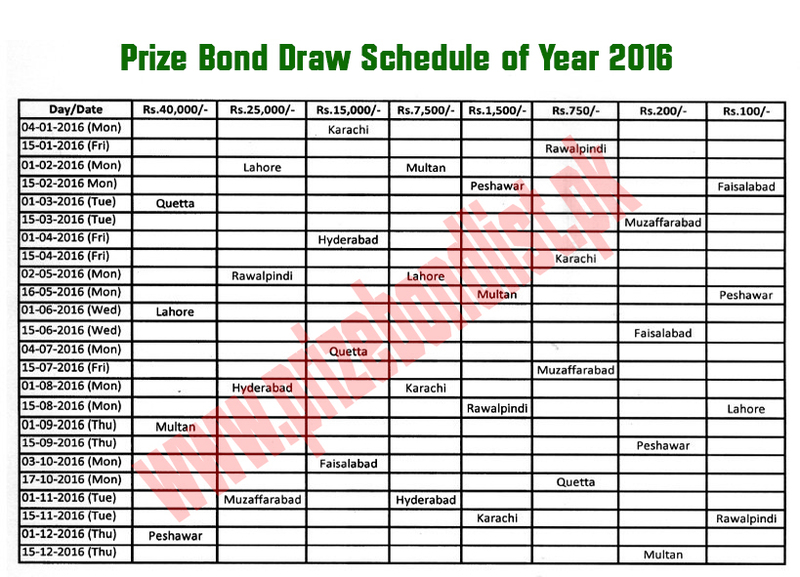 You will find Prize Bonds lucky Draw Calendar & Dates in Pakistan from January to December like a complete year. You can download Prize Bond 2019 Draw Schedule for your desktop for convenience to see any time online. 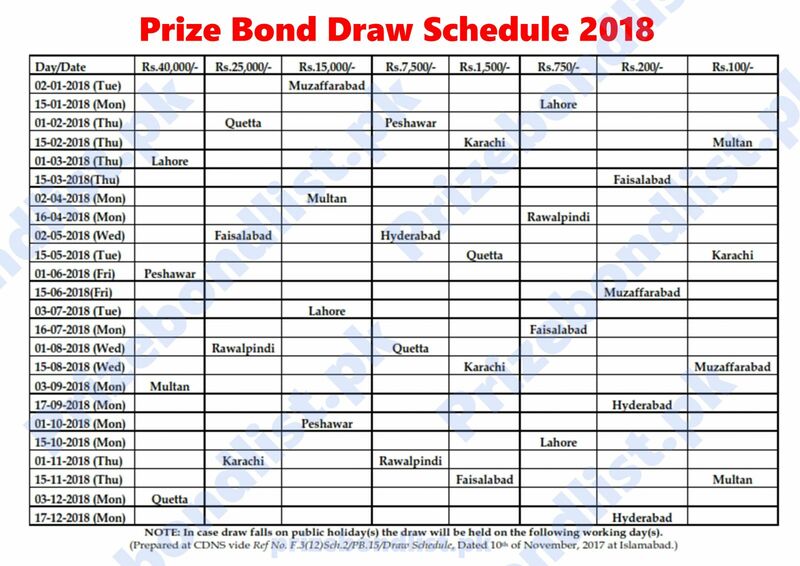 See here complete Prize Bond Schedule 2019 by National savings of Pakistan.